MaxMini has made it quite a ways in their The Green Alliance Kickstarter campaign. Check out the new unlocks over on their page. Another unlock - WOW! 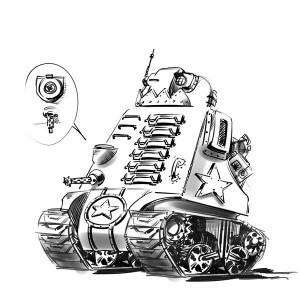 Goblins certainly looked with envy at large clanking machines their bigger bros operate and after some tinkering with their tanks they have come with a beastie of their own. This concept has been made by Kerim and certainly his love for all things green (he hast a vast collection of orcs) shows :) . That's a pretty fun model to make - and possibilities of arms options are endless. Now we need to shorten a list of ideas to the best ones ;) .